TPC now suppors for CAD’s arc aligned text. You can import and export arc aligned text from DWG and DXF files. We added the ability to align curve / spiral labels a few releases ago. 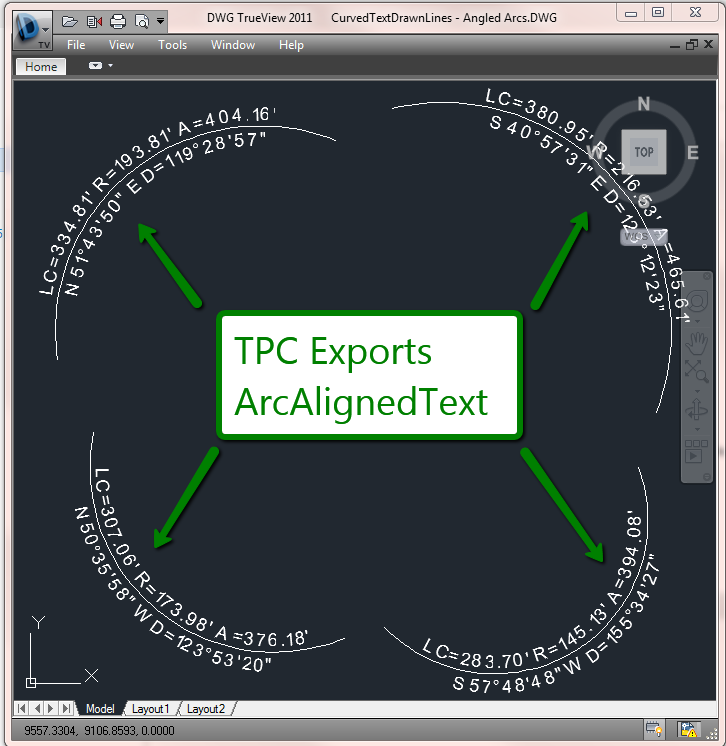 Now, if the label is aligned to an arc, TPC imports / exports it to CAD as an arc aligned text entity. Labels for spirals are still exported to CAD as individual characters in order to retain their proper orientation. Here are some labeled arcs TPC wrote to AutoCAD. You could have drawn these arcs manually or labeled a horizontal curve via a traverse. Either way, TPC knows these labels reference an arc, so TPC exports the label to CAD as an arc aligned text entity. When TPC imports an arc aligned text entity from CAD, it retains the alignment values from CAD. These include character width factor, character spacing and character offset from the arc. You can see these values by expanding the label in TPC’s Drawing Data Manager. Retaining these values insures that TPC can recreate the label the way it appeared in CAD. You can edit arc aligned text just like you any other text in TPC drawings. Change the text size, color, font, etc. TPC includes several sample stamps in it’s Blocks folder. 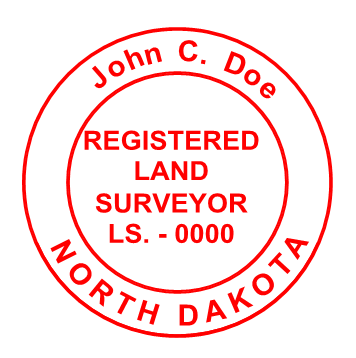 We’ve added the North Dakota stamp which uses arc aligned text. Just import the block, explode it or convert it to a group, then edit the name and registration number. Now you can save it back out as your own ND stamp. Or use this as an example to create a block for your own circular stamp. You can now compute areas using Open and Closed Point to Point traverses. In previous versions of TPC, you could only compute areas from Closed Loop traverses. Starting in Release 2, TPC forces the closure of any traverse that is not a Closed Loop. 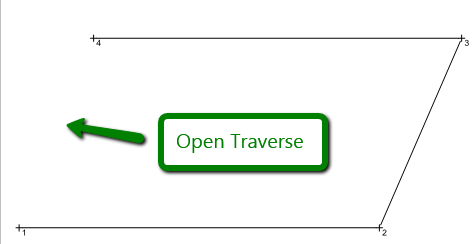 It then performs the area computations as if the traverse were a Closed Loop. It sounds pretty simple, and it is. These decimal places carry through to printouts, reports, the Closure View and more. Of course, you can still specify selected decimals for things like Legal Descriptions and drawings. 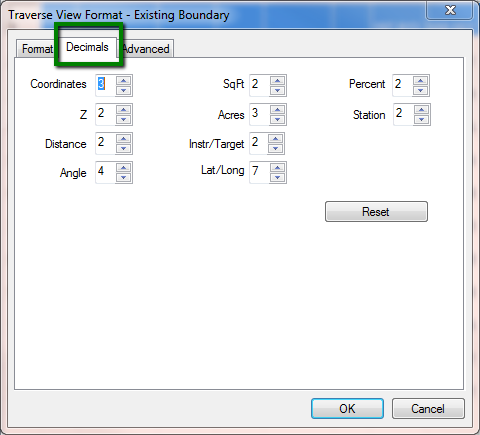 You can find the new Traverse View Format Decimal settings in the familiar View | Format View… command from any Traverse View. Another feature of the Traverse View Decimals is the ability to select traverses from the Traverse Manager and edit all the selected traverses’ View Format Settings from one dialog. The What list now includes selected drawing objects as an option. From the Drawing View click Edit | Select Objects then press the ‘W’ key to select drawing objects through a selection rectangle, now you can select a huge number of items from the Drawing View with this simple command. Did you know about the ‘W’ we just mentioned. When selecting objects, you can left click any object to select / unselect it, press ‘W’ for Window or ‘C’ for Cross. When you’re all done selecting, just right click. Why new What list item? Sometimes it is easier to select objects from a drawing than it is to select them from a view. That’s why we added this option. So go ahead and select the objects you want from a drawing. TPC will see which of those objects reference a survey point and will perform the operation on just those points. What else can you do with the new What list item? 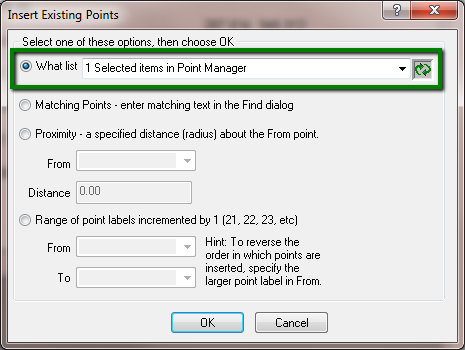 Relabeling points, converting points and anything else that requires a What list now benefits from the new Selected Drawing Objects What list option. We added the now familiar What list to this dialog, making it easy to insert points you’ve selected in another view. Using our new “Selected Drawing Objects” What list item you can select objects in a drawing and use that option from the What list to add points directly from a drawing. 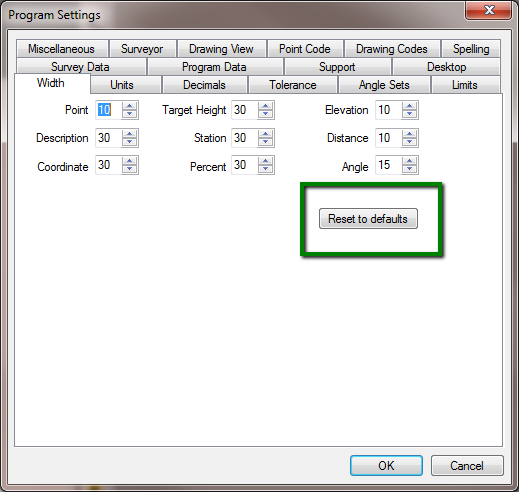 We added a Reset to Default button to the program settings dialogs. Want to get back to Traverse PC’s default values? Just press this button and you are there. You’ve told about some help topics we needed to add, and we did. Remember, the help topics are like the old manuals that used to come with the software. They have a Table of Contents, Index and lots of detailed information. And because they are digital, you can search for anything in the help content. We like to remind folks that there is a whole help system available in TPC Desktop because we hear it all the time, “You mean I can just press F1 for help?”. So if you need it, it’s there. In the TPC Online panel of the Task Manager, we added a direct link to our support web page. Click it to access additional on-line resources and technical support. If you are on the TPC Connection, or if you pay for a technical support incident, we can log onto your computer and help you solve the problem right on your computer. We do this through the Meetings feature of RingCentral, our company phone system. You can learn more about this by clicking the Support On Line link shown here, then clicking the On Line Screen Sharing tab.